HCM CITY – Online shopping is expected to surge in the remaining months of this year with many e-commerce players launching promotions. During this period the biggest promotion will be Singles’ Day on November 11, which has become popular in Asia and a huge commercial hit. According to Criteo, an advertising platform, November 11 was originally celebrated in Chinese universities and meant for singles. It then spread to other markets like Taiwan, Indonesia, Việt Nam, and Singapore. Silvia Siow, Criteo’s head of account strategy for Southeast Asia, Taiwan and Hong Kong, said: “In recent years the day has become a major opportunity both for shoppers and online retailers. “This is not just a one-day celebration but the clear start of the winter shopping season. For Vietnamese market, Siow said, the retail sales during November 11 last year increased by 245 per cent compared with the time from 24 to 30 September 2017. She told Việt Nam News that sales would further increase this year. In Việt Nam last year the biggest sales day was December 12 but sales remained high for the next two days, she said. Retailers should benefit from the momentum created by November 11 and maximise sales by sustaining promotional efforts until December 21, she suggested. An online shopping insights and trends piece presented jointly by Facebook and Shopee, which found that shoppers in the region, especially mobile shoppers, are increasingly regarding Singles’ Day as an integral part of the year-end shopping season. According to Facebook conversion data across six APAC markets, 1.3 times more conversions were generated on November 11 than on an average day that same month while the share of mobile conversions during the holiday season grew to 76 per cent. To capture the opportunities, in the current week online marketplaces launched promotion programmes. 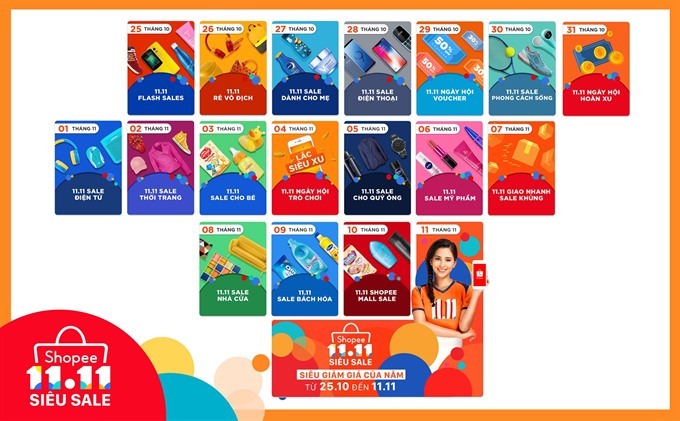 Shopee, an e-commerce platform in Southeast Asia and Taiwan, launches November 11 Shopee Siêu Sale which features an upsized and improved package of non-stop promotions from 25 October to 11 November, including the return of the highly-popular themed days, new in-app games, and deals at up to 50 per cent off across all categories and more. Kyaw said last year’s campaign far exceeded his company’s expectations on all fronts and that motivates them to organise this year’s November 11 event with more incentives to bring consumers excitement and surprises. Another online marketplace, Lazada, invites shoppers to make the most of its November 11 shopping festival along with plenty of entertainment, celebrity interactions and shopping deals and discounts. Lazada said Vietnamese shoppers would be able to enjoy the full customer shopping experience during its biggest sale just like all shoppers in Indonesia, Malaysia, the Philippines, Singapore, and Thailand with bigger and better deals. Shoppers across Southeast Asia can look forward to more than 50 million deals, including discounts of up to 90 per cent on more than one million items during the 24-hour shopping spree.